This set of print awareness how many letter strips has 41 Dolch preprimer words on them. This set does not have any pictures to go with the words. 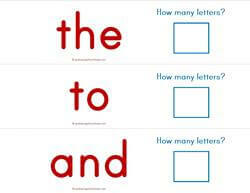 Your kids read the words, count how many letters are in the words, and write them on the cards with a dry erase marker. Print several copies of this set, put on word rings and use at center times. Print these strips on cards stock and laminate.